I'm sitting here watching the rain pound down outside. (Is this now only a tropical storm and not a hurricane? Either way, it's quite a show, Mother Nature...) I'm craving ice cream. What's new? 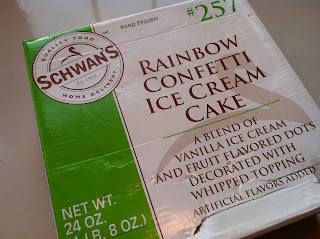 Unfortunately, I am not sure Schwan's delivers this quickly and I'll bet they aren't even delivering in this weather...I'm particularly craving Schwan's Loaded Waffle Cone Peanut Butter Swirl ice cream. It has happened more than once than we have gotten samples from somewhere I have never heard of and Husband was familiar with them because they were a Minnesotan company. A couple of months ago, we got a package from Schwan's Home Delivery. They sent the ice cream cake that Tina wrote about and two cartons of ice cream. I digress. So anyway we got a carton of the aforementioned Loaded Waffle Cone Peanut Butter Swirl ice cream as well as “Monkeying Around” Banana ice cream, "the winning flavor from [their] Facebook contest last summer." I liked the Monkeying Around, but I am not a huge huge fan of banana ice cream, and even the chocolate covered bananas and graham cracker swirl could convince me that it was going to be a favorite. Husband really liked it though, as did a friend who is a huge banana anything fan. For me I was taken by the Loaded Waffle Cone Peanut Butter Swirl. I loved the peanut butter swirls and the fudge covered cone. I love in ice cream how the peanut butter hardens but isn't too hard...The fudge surrounding the waffle cone kept the cone from getting too soggy, as can be a problem with once-crispy mix-ins. And "loaded" it was. Schwan's does not skimp on the mix-ins. I have to admit, I was a bit disappointed to be the polite daughter-in-law and tell my father-in-law he could finish the Loaded Waffle Cone Peanut Butter Swirl. But I was a great daughter-in-law, let him finish it, and I hope I get brownie -- er, um, ice cream -- points for that! Since it's delivery, it seems like their prices are a bit on the higher side than you might find for a carton you'd buy at the store, but c'mon -- ice cream delivered to your door?! I think it's worth the extra buck. I'll definitely be hitting up Schwan's again sometime in the near future. Storm's letting up. Do you think they'll deliver in this wind!? I didn't know this when we started or we would have gone with something more mailable. Ice cream can be quite expensive to mail! I'm only kidding. I wouldn't blog about anything else AND quite honestly, we have been super spoiled with the samples and giveaways we have gotten. The latest was a super cool basket of goodies from Smucker's. What's even cooler (no ice cream pun intended) is that they have offered an additional basket for one of our lucky readers. Eagle Brand Sweetened Condensed Milk and other ingredients to make homemade ice cream – it’s easier than you think! Recipe booklet full of ideas and coupons to help you celebrate every moment this summer! 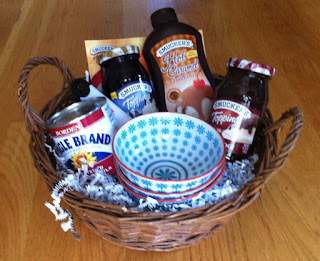 My basket just arrived Wednesday and I haven't had a chance to play around with any of the recipes on their main site or their Facebook site, but I can't wait to try a Chocolate Overload Sundae: "Rocky Road ice cream topped with Smucker's Marshmallow Topping and a generous portion of Smucker's Microwaveable Hot Fudge" (#6 on the list here on smuckers.com). I also love blueberry and I want to try making some ice cream with a blueberry swirl. It's a busy time of year, so we don't need you to make recipes but we do want your opinions and ideas. What sounds good to you? What frozen treat would you make with your winning prize pack? Would it be something of your own creation or one of the ideas from the Smucker's website? Let us know what ice cream treat you would make with your prize pack. Leave us a comment by Wednesday, August 31, 2011 at 11:59 PM PST for a chance to be a winner. Winner will be chosen at random. You MUST include your email address. You can either leave it in your comment or email us at scoopaliciousblog@gmail.com. Unfortunately, we have learned from past experience that even though blogger asks for your email address in the form, there is no way for me to access it. If we do not have your address, we unfortunately cannot award you the prize. The entry period has closed for the SONIC gift card and fun straws giveaway. I was thinking of using random.org, but decided to go old school, put the names in a bucket and have my one year old choose the winner...So, Jenn, Julian, you can thank Violet! Congrats! The whole family took a trip to SONIC on Saturday afternoon to use our gift card that the folks at SONIC sent us. It's a great date-with-a-baby spot since all potential tantrums take place in the car, not in a restaurant surrounded by others who really don't care to hear screaming. Lucky for us, we didn't have any tantrums. 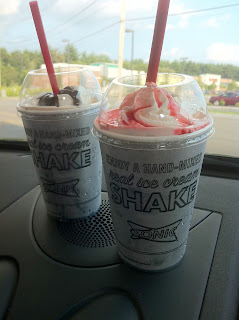 We did have some yummy Sundae Shakes though. I had hot fudge and Husband had the strawberry. We both were happy, though Husband felt the shakes weren't particularly "sip-able" (as they are advertised) until they have melted a bit. Husband is a bit impatient. But then again, they were good, so it made sense he was impatient. It was, as appropriately named, just like a sip-able soft serve sundae. Very familiar and very refreshing and fun to drink! We did just get word that the Sundae Shakes are there for a limited time -- so you'll have to hurry on over to try them. We also got word that the next SONIC treat to arrive on the scene will be Pumpkin Pie Shakes. Um, yes, sister Arianna (of Librarianna and Real Art Ways Archivist fame -- yeah, I am kinda proud of my sister's new profession as a librarian), this news is for you. There's still time to enter the giveaway so you can win a SONIC gift card -- to try the Sundae Shakes, the Pumpkin Pie Shake, or anything your SONIC heart desires! OK, now tantrum awaits, so I have to jet. More soon! 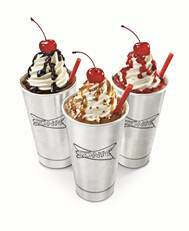 SONIC contacted us a couple weeks ago about their new Sundae Shakes, offering to send both a lucky reader and us at Scoopalicious a $20 gift card to SONIC as well as some super fun drinking straws. Available for a limited time in three delectable flavors: Turtle, Classic Hot Fudge and Strawberry Dream. 100% sippable (no spoons necessary!) and served in a new metallic cup. Made with SONIC’s Real Ice Cream. The weather is perfect for a drive-in treat, but with a teething daughter who hasn't been sleeping too well, we haven't gotten a chance to head up north to our nearest SONIC to try them. But that shouldn't keep us from sharing our good fortune with one lucky reader. Note: Please leave your email address in case you win. If you don't want to post it here, you can email us at scoopaliciousblog (at) gmail (dot) com. It's been a long week since the family trip to NH in the outdoors of New England with Scott and Holly and Chace just enjoying each other and all that is great about New England in the summer….Storyland, outdoors, and ice cream. I had intended to upload some ice cream pics as we enjoyed it but wherever we were service was spotty so now i get to showcase it all and more. 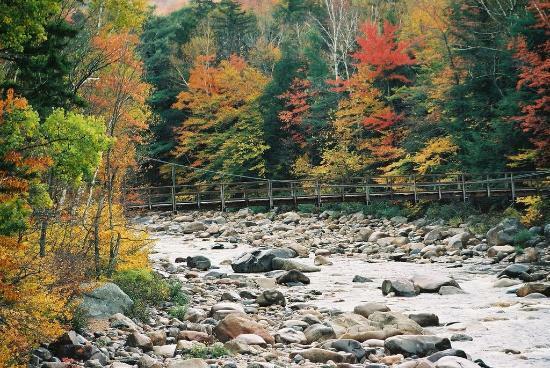 So we were on our way to North Conway, NH for a family vacation, described in tourism magazines as the shopping mecca of NH which makes me snicker quite a bit. Many of you know that it's a quick ride up there but with two kids in tow it's never that way but we somehow managed to get up there rather quickly and only stopped for ice cream once along the way. It was a good old rest stop novelty item had by Holly. Anyways, on our way up Rt 16 heading towards Conway we saw the cutest shop, The Dam Ice Cream Shop, located amazingly on a dam. We took a mental note and continued on. Well our first night didn't consist of ice cream but it did entail stopping at the local grocer to stock up on a half gallon for the week(great thing about renting a condo instead of a hotel…a fridge for cocktails and ice cream!) which my daughter chose the Hannaford's store brand, Overloaded Peanut Butter Cup Infusion. It was actually not so bad. Day one….called for clouds so the hubby took the kids to an indoor water park and well I shopped at the "mecca" with my BFF and the highlight of the day was our last stop to Molly B's Ice Cream. Located on Rt 16 just past the center of town in what seemed to be an old storefront. And when I say old probably 1800s old. Upon walking in it was sort of cute and really bright pink but definitely needs some TLC in the decor department. There are a couple small tables inside and some picnic tables outside. 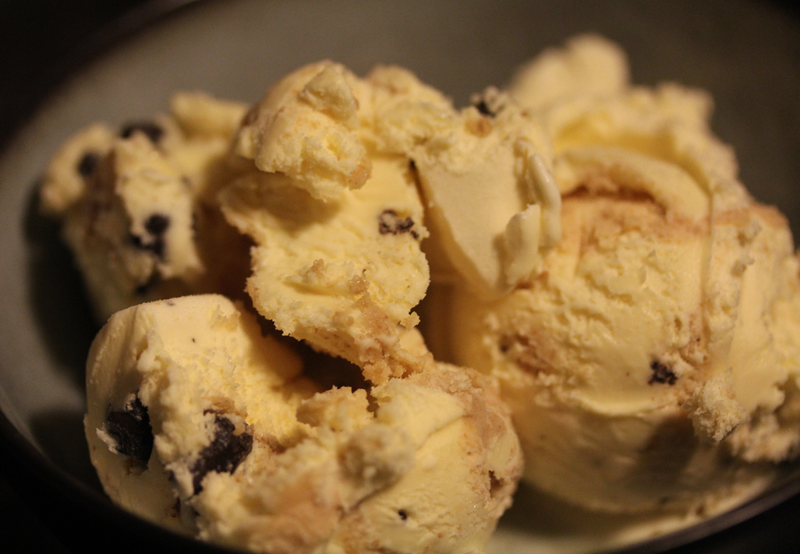 Regardless I was there for ice cream and I immediately saw a flavor I had to have….Peanut Butter Caramel Cookie Dough. Seriously what else could be in this. 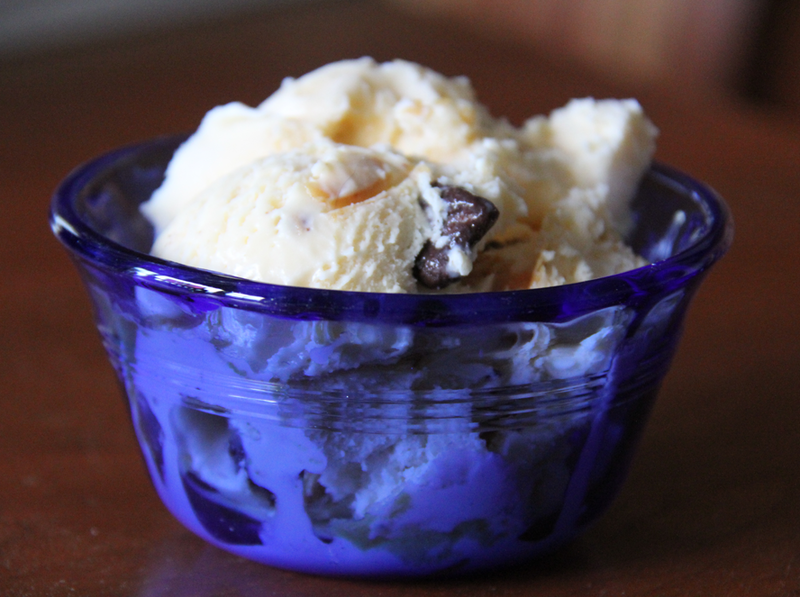 It was exactly what it sounds like…vanilla base with mini peanut butter cups, swirls of caramel and chunks of cookie dough. 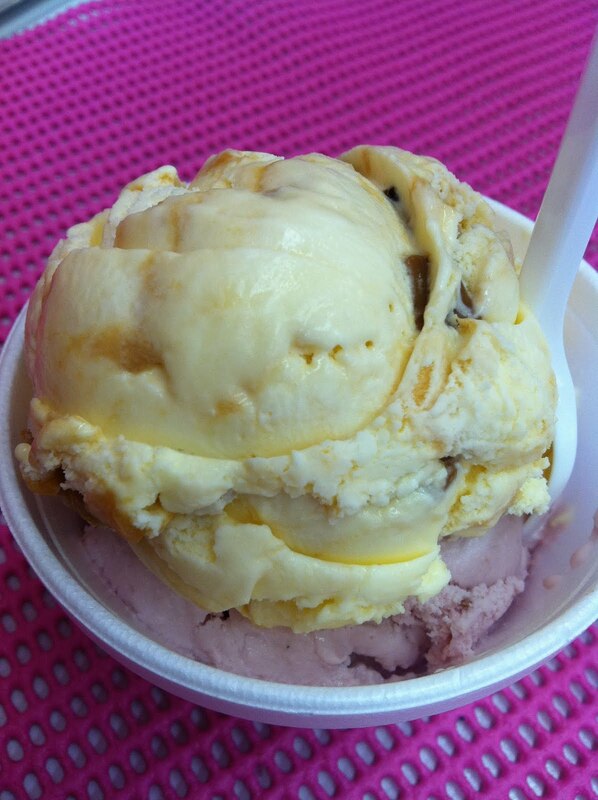 Yes it was very sweet but awesome and then because I always have to try two flavors, I chose Maine Wild Blueberry. Some fruit to balance out the sweetness. Both were awesome and I would take seconds any day. 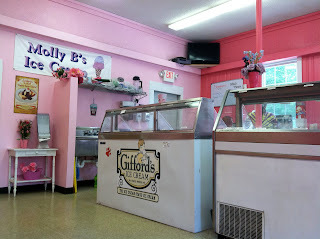 The ice cream isn't homemade but made by Gifford's which is a great New England brand. Portion sizes were quite good too. I ordered a small with two flavors and it was more than enough. 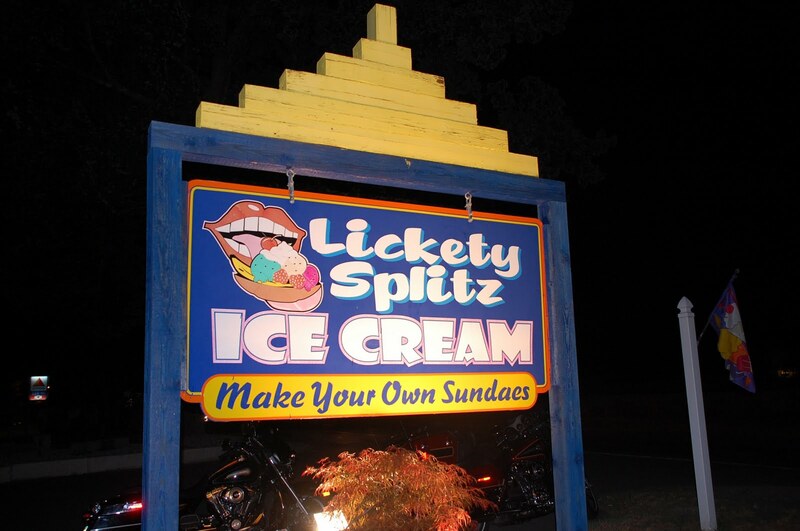 Next stop and one we also had our eye on when we drove in was Lickety Splitz, this too located on Rt 16 in North Conway but before the main part of town. I think it was the playground that did it for me knowing i could enjoy my ice cream while the kids played. This is more of your typical ice cream shop but pretty neat decor with all vintage decor and lots of seating. They had these old phones lined up against the wall and my son who is just starting to talk found it amusing to pick up every phone and scream "heeewwwwwooooooo!" which entertained the whole place. Too cute! So ice cream time…my choices of the evening were Cake batter and Mint Chocolate chip. My daughter chose Chocolate Lovers (or something like that) which I was quite jealous of after the fact and Scott's Strawberry looked suuper refreshing.. The Mint was what I expected nothing special but still good and the cake batter was the traditional yellow cake batter and was really good and nice and smooth. Always a favorite. They also had a sundae bar with tons of toppings which Holly of course had to get and smothered her ice cream with homemade whipped cream and sprinkles. It was late but we had plenty of time for the kids to enjoy the small playground as we enjoyed our ice cream. Oh and my guess is they too serve Gifford's ice cream. Next day, next stop…back to Molly B's and only because it was closer to the condo and late and my daughter was growing many heads at the thought of not getting ice cream before bedtime so we made a quick stop. I had to go back for seconds of that Peanut Butter Caramel Cookie Dough and it was as good this time as it was the first. But three days in a row of ice cream was getting excessive so one flavor in a very small dish did it. The family…they had Rum Raisin (Scott's all-time favorite) and the kids had Oreo Cookie and Vanilla. Poor Chace gets vanilla wherever we go..less to stain! And then we saved the best for last on our drive home, the Dam Ice Cream shop. 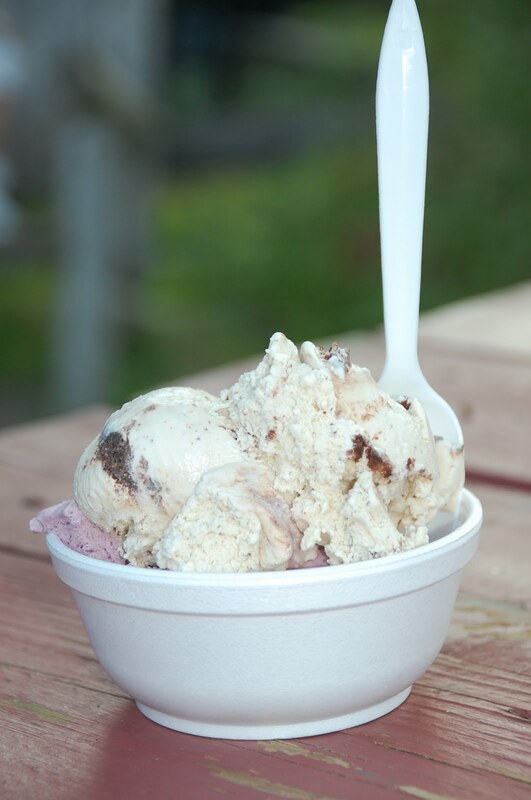 This is the true New England ice cream shop on a charming little dam serving homemade Bobby-Sue's ice cream. And it was right on our way home on Rt 16 in Chocorua, NH about 20 minutes south of Conway NH. It has two little take out windows on a deck with some seating and and cute little eat in area but also picnic tables and seating by the dam. They also have a little gift shop but it was all way too little trinkety country things for me so we just enjoyed the ice cream. I have a laundry list of flavors we all tried. I had Kahlua Brownie and Black Raspberry and the rest tried Cappuccino Crunch, Peanut Butter, Cookie Dough and Vanilla. I have to say I was impressed by them all. I loved the Kahlua Brownie. Just the right touch of Kahlua flavoring to not be too strong and the brownie pieces were sweet and just the right amount distributed throughout. The Black Raspberry was quite good but again nothing too out of the ordinary. It was the Peanut Butter that stood out to me. It was just a smooth peanut butter flavor with no mixins. You might have thought it was vanilla had you seen it but it was super smooth and creamy. Scott is lucky I only had one bite. I didn't try his Cappuccino Crunch but he said he really liked it and said it wasn't strong at all which is what his concern was when ordering it. I loved the atmosphere, the service and the ice cream and the serving sizes were very good too. 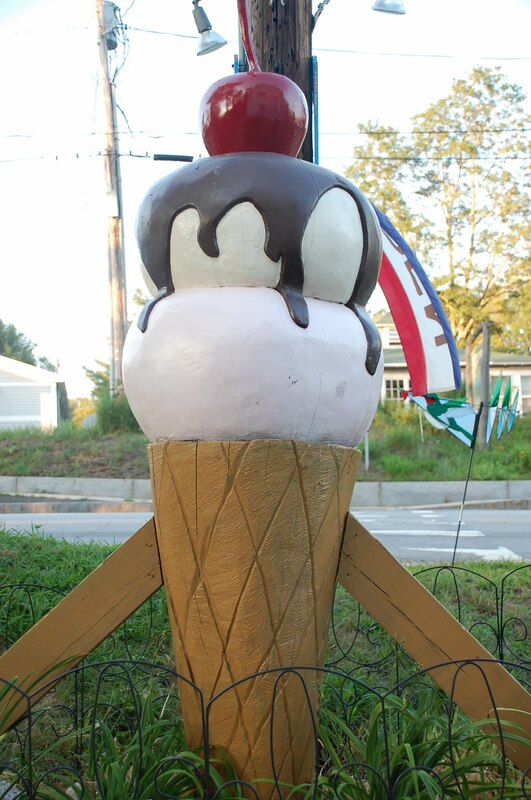 Apparently Bobby-Sue's has been a local homemade ice cream for 29 years and is located in Freedom, NH serving local restaurants and shops. I had never heard of them before but glad I had the chance to try it. I know we will definitely be back. And finally….home where I finished off the Ciao Bella Fat Free Mango Sorbet! No guilt since the days prior did enough damage! I always love to come home to a styrofoam container on my doorstep because that means some great brand wants me to test out their ice cream and let you all know how it is. So really, who turns down ice cream especially when it is delivered to your doorstep. This time around the ice cream was from Schwan's. Honestly I hadn't a clue who or what Schwan's was so quick to my computer I went to and turns out they are an online grocer and food delivery service providing "delicious, easy-to-prepare meals and friendly personalized service". Hmm..let's see a full time job, two kids, and a blog to keep up with…sadly prepared foods are right up my alley. When I said the name most friends said "hey I've seen those trucks" but I can't say I know anyone who has used the service. Unfortunately we didn't get any pizza or crabcakes but we were lucky enough to get a 1/2 gallon of Loaded Waffle Cone with Peanut Butter Swirl Ice Cream, another of Monkeying Around Banana Ice Cream, and a Rainbow CONFETTI™ Ice Cream Cake. Lord knows I could probably eat all this ice cream we get myself but I really do try to share it with others so they can also give their opinion because one person's opinion might not always be the best review. So lucky enough I had a playdate planned…the perfect occasion to break out the Rainbow CONFETTI™ Ice Cream Cake. I can't even tell you how excited the kids were to have ice cream cake. Why do ice cream cakes only seem appropriate for parties? All it is is ice cream in a cake form. Why not eat it every day? So anyways we broke open the box and saw a sort of sad looking cake but I have to take credit for that as I don't think the 40 minute ride there did it any good. It is not so big either, about 7", but plenty for the small group we had. So I think I have to let this video speak for itself about how much the girls loved this cake. And there truly was no prompting as they loved it and came back for seconds. The adults had a different take on this and I am in this pool of thoughts. I was totally expecting the "confetti" to be more like sprinkles but as the kids described they were sort of like Nerd candy. Very sweet and it was throughout the ice cream so there was no avoiding. What I do have to say I loved was the whipped topping. Very similar to the Carvel cake frosting..ooh so good. In all the cake goes for $12 and serves about 8 people. I think for a small kids party this would be a great dessert but not an ending to an adult dinner party. Have you ever used the Schwan's food service? I really am interested to know how it is. Some of the products really look good and I heard the service is supposed to be top notch. Drop us a note if you have. We'd love to hear more about it. My birthday was two days ago and my dear friend Anisha knows the way to my heart. She surprised me with an ice cream cake...Oreo. Maybe it's because I never had Oreos as a kid except for when they were swirled into ice cream to make Cookies 'n' Cream, or maybe it's the Cookies 'n' Cream that makes me nostalgic, but Oreo Ice Cream/Cookies 'n' Cream is one of my all time favorite flavors. This cake was perfect. Cookies 'n' cream ice cream with a giant oreo in the middle. It was edged with vanilla frosting which was then covered with Oreo cookie crumbs. I loved it. It certainly was a happy birthday to me -- ice cream cake after dinner and Richardson's ice cream for lunch before Harry Potter. Please note (especially you, Ashu) these are very different than tart frozen yogurt places like Pinkberry I have blogged about before. These bars are: Self-serve. Tart or Creamy. 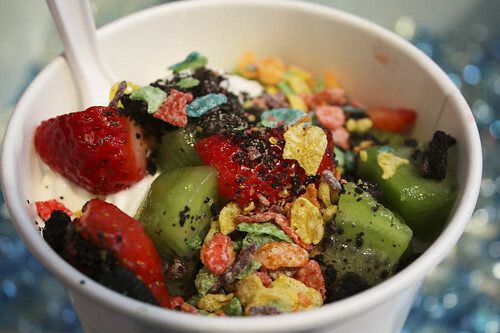 Tons of toppings. When I was visiting my inlaws in Prescott, Arizona, they took Husband and I to my first self-serve frozen yogurt bar: Frozen Yogartz. While I had never heard of them before, Lisa says there are a bunch of them in Boulder, Colorado as well. Used under the Creative Commons License. It's a fun concept. You choose a flavor of frozen yogurt and pump as much of it as you want into your container. At Frozen Yogartz, there were about ten flavors to choose from, some of them permanent, some of them rotating. Then you go to the toppings bar and top, top, top. They charge you by weight, so you just have to be sure your eyes aren't bigger than your stomach, because you are paying for it! I "yelped" frozen yogurt bars in the Boston area and found at least one. Truthfully, I am surprised ice cream sundae bars never appeared before this. I love "make your own sundaes." Why didn't I think of this?